Punjab (Urdu: صوبہ پنجاب‎) is a province in Pakistan. The capital of Punjab is Lahore. Punjab has a population of 80 million people and an area of 79,284 mi² or (205,344 km²) in terms of area the province of Punjab is greater in area than Kyrgyzstan but smaller than Belarus. The word Punjab is a combination of the Indo-Iranian words panj (five) and āb (water), and thus the (land of) five rivers. The five rivers are the Indus, Chenab, Jhelum, Ravi and Sutlej. Sometimes, in English, there can be a definite article before the name i.e. the Punjab. The name is also sometimes spelled as Panjab or Panjaab or Punjaab. The name Punjab was given to the region by Turkic Muslim conquerors and popularized during the reign of the Mughal Empire in the 17th century CE. Before 1947 both Pakistan and the Republic of India were ruled by the British. The Punjab province used to be a part of British Punjab. In 1947 the Muslim majority voted yes, Sikh minority voted yes, Hindu minority voted no to Partition thereon, the British province of Punjab was split between Pakistan and Bharat via the Radcliffe Line and the Ferozpur District and the sub-district of Gurdaspur awards were originally meant to go to the Pakistanis, however it was decided on August 18th to allocate them to East Punjab. Today India has a state called Punjab since 1966. A bus service was launched in 2006 connecting Lahore in Pakistani Punjab with Amritsar in the Republic of India, through the Wagah international border. This was the first bus service between the two Punjabs for almost 60 years. Wagah, named Wahga in Pakistan, is a village through which the controversial Radcliffe Line, the boundary permanent Demarcation line dividing the Indian Punjab from Pakistani Punjab upon the Partition of India, was drawn. The village was divided by independence in 1947. Today, the eastern half of the village remains in the Republic of India while the western half is in Pakistan. It is particularly known for the elaborate Wagah border ceremony that happens at the International border gate before 5PM each day. Since the 1950s, Punjab industrialized rapidly. New factories were established in Lahore, Multan, Sialkot and Wah. In the 1960s the new city of Islamabad was built near Rawalpindi. Agriculture continues to be the largest sector of Punjab's economy. The province is the breadbasket of the country as well as home to the largest ethnic group in Pakistan, the Punjabis. Unlike neighbouring India, there was no large-scale redistribution of agricultural land. As a result, most rural areas are dominated by a small set of feudalistic Zamindaror the land-owning families. In the 1950s there was tension between the eastern and western halves of Pakistan. In order to address the situation, a new formula resulted in the abolition of the province status for Punjab in 1955. It was merged into a single province West Pakistan. In 1972, after East Pakistan seceded and became Bangladesh, Punjab again became a province. Punjab witnessed major battles between the armies of India and Pakistan in the wars of 1965 and 1971. Since the 1990s Punjab hosted several key sites of Pakistan's nuclear program such as Kahuta. It also hosts major military bases such as at Sargodha and Rawalpindi. The peace process between India and Pakistan, which began in earnest in 2004, has helped pacify the situation. Trade and people-to-people contacts through the Wagah border are now starting to become common. Indian Sikh pilgrims visit holy sites such as Nankana Sahib. Starting in the 1980s, large numbers of Punjabis migrated to the Middle East, Britain, Spain, Canada and the United States for economic opportunities, forming the large Punjabi diaspora. Business and cultural ties between the United States and Punjab are growing. 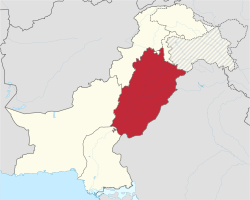 Punjab is Pakistan's second largest province at 205,344 km2 (79,284 sq mi) after Balochistan and is located at the northwestern edge of the geologic Indian plate in South-central Asia. The capital and largest city is Lahore which was the historical capital of the wider Punjab region. Other important district cities include Multan, Faisalabad, Sheikhupura, Sialkot, Gujranwala, Jhelum and Rawalpindi. Undivided Punjab is home to six rivers, of which five flow through Pakistani Punjab. From west to east, these are: the Indus, Jhelum, Beas, Chenab, Ravi and Sutlej. Nearly 60% of Pakistan's population lives in the Punjab. It is the nation's only province that touches every other province; it also surrounds the federal enclave of the national capital city at Islamabad.This geographical position and a large multi-ethnic population strongly influence Punjab's outlook on National affairs and induces in Punjab a keen awareness of the problems of the Pakistan's other important provinces and territories. In the acronym P-A-K-I-S-T-A-N, the P is for PUNJAB. The province is a mainly a fertile region along the river valleys, while sparse deserts can be found near the border with Rajasthan and the Sulaiman Range. The region contains the Thar and Cholistan deserts. The Indus River and its many tributaries traverse the Punjab from north to south. The landscape is amongst the most heavily irrigated on earth and canals can be found throughout the province. Weather extremes are notable from the hot and barren south to the cool hills of the north. The foothills of the Himalayas are found in the extreme north as well. ↑ Singh, Pritam (2008). Federalism, Nationalism and Development: India and the Punjab Economy. London; New York: Routledge. p. 3. ISBN 0415456665. ↑ "How to obtain a police certificate - India". Cic.gc.ca. 2009-11-09. Retrieved 2010-07-18. ↑ 4.0 4.1 Frank Jacobs (3 July 2012). "Peacocks at Sunset". Opinionator: Borderlines. The New York Times. Retrieved 15 July 2012. ↑ "Google". www.google.com. Retrieved 2017-04-14. Wikimedia Commons has media related to Punjab (Pakistan). This page was last changed on 25 May 2018, at 13:40.